Students explore their options for life after high school and implement plans to achieve their goals. They identify their aptitudes, skills, and preferences, and explore a wide range of potential careers. They investigate the training and education required for the career of their choice, and create a plan to be sure that their work in high school is preparing them for the next step. They also receive practical experience in essential skills such as searching and applying for college, securing financial aid, writing a resume and cover letter, and interviewing for a job. This course is geared toward 11th and 12th graders. Students begin to identify their goals, values, and strengths. They take online assessments of their personality types and career interests and begin to look at careers that may be a good fit. They write personal statements to learn to identify and describe what would make them unique contributors to a college or a workplace. Students identify their personal criteria for choosing a career, and select three careers of interest to investigate further. They learn how to use the Occupational Outlook Handbook to find information about knowledge and skills, tasks, education and training, compensation, and employment statistics and projections. They select a single career to fully investigate, and report on their findings in a virtual "career fair." Students learn about all the possible forms of post-secondary education that are available to them, including vocational training and military opportunities. They identify their personal college selection requirements, search for appropriate colleges and other training programs online, and present their findings. Students identify their career and college goals using the SMART goals model. They identify potential barriers, possible solutions to those barriers, and support systems they can turn to. They develop a plan to meet their goals and discuss motivational techniques to stay on track. 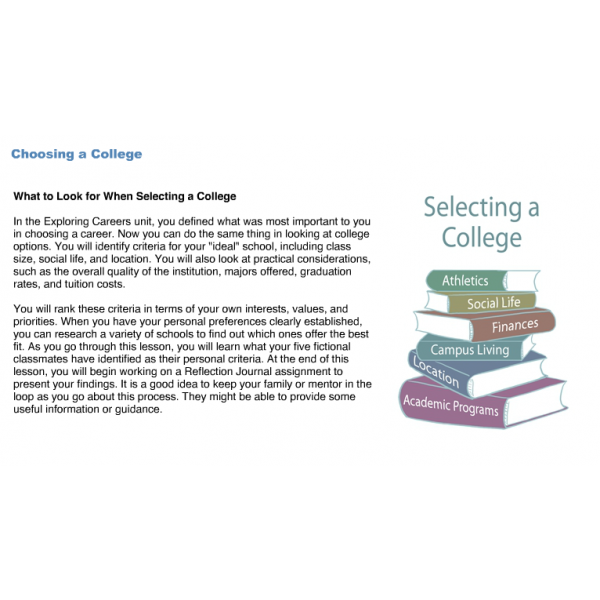 Students learn about the college admissions process and typical entrance requirements, then engage in all the steps, including completing an application and an essay and gathering transcripts and letters of recommendation. They learn the process for a successful college interview and act as admissions counselors themselves, reviewing sample applications and collaborating with their classmates on selecting successful candidates. They learn how to find and secure financial aid. They learn the criteria for making a final college selection, and consider the key similarities and differences in personal responsibility and daily life between high school and college. Students learn how to search for available jobs. They research company/job requirements; complete a job resume, application, and cover letter; and participate in an informational interview. They consider key elements of personal responsibility and daily life as adults in the workforce. They learn strategies for long-term career management and personal growth. Students compile all of their work into a Career and College portfolio that they can use as a resource for real-world college and job research and applications.